“Critter wines! Noooooooooooo. We thought maybe we’d put a dent in that trend years ago, when we first coined that term for wines with cute animals on the label. But it seems like there are more than ever. What brings this to mind is that Media bought one recently — ”the animal was so cute” — and found the wine ”disgusting.” Unfortunately, that’s too often true. There are exceptions, of course, but not enough to risk it. Just goes to show: You should listen to your parents!” Dorothy Gaiter & John Brecher (the very much missed, former Wall Street Journal Wine Columnists) on Facebook. They are smart enough to realize there are exceptions to bad ‘Critter Wines.’ We recently found one of these exceptions at the very north end of Paso Robles. While taking a shortcut enroute to appointments at Justin Vineyards and then Denner Winery, we followed the GPS off Highway 101, taking San Marcos Road to the west. Enjoying the scenery on our route we came upon a very large winery. 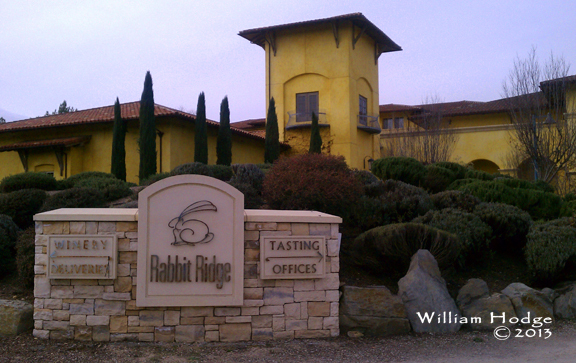 It’s name – Rabbit Ridge. It was big and attractive, so we thought, let’s check this out. Their wine tasting facility sits in the middle of their warehouse where you wander through, past the forklift and around the barrels of maturing wine. While it was a little cool inside, they set up two heaters next to the bar and chairs for comfort. As you can see by the many plus signs, we enjoyed this wine, even the Chardonnay which is not our first choice of wine. Our purchase? Three bottles of their 2010 Estate Primitivo. As a close cousin to Zin, we usually enjoy Primitivo and this was no exception. Since we didn’t give them a whole lot of time we’ll need to get back to Rabbit Ridge and this region. 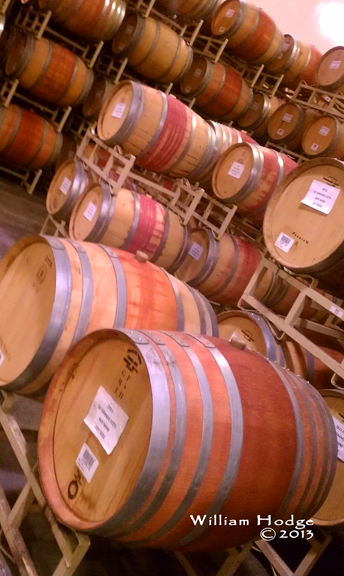 On San Marcos Road we passed three or four other wineries that merit exploration. If you’re in the area you should also visit this far north west sector of Paso Robles. This entry was posted in Blend, California Wineries - New World Wines, Chardonnay, Cuvee, GSM, Paso Robles AVA, Primitivo, Sangiovese, The Pleasures of Tasting Wine, Thoughts About Wine - Exploding Ruby Flowers On Your Palette, Vinotypes, Zinfandel and tagged bottle, brecher, california, chardonnay, dorothy, gaiter, john, paso, robles, tasting, wine, wineries.